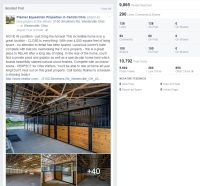 This is a great entry level advertising option - ideal for promoting Horse Shows, Clinics, Horses for Sale, Help Wanted, Open Houses, Real Estate, Barn Events and Fundraisers. 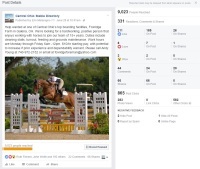 Premier Equestrian Marketing will promote your event on all Social Media Platforms and will guarantee exposure to a MINUMUM of 5,000 equestrians residing in the exact geographical region you want us to target (we can broaden this demographic at your request). Your Spotlight ad will recieve exposure to the exact market you are trying to reach - down to the EXACT Discipline your event is directed to. 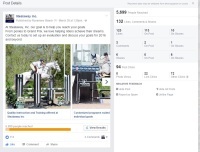 Plus - Your ad will be SPONSORED to ensure it will be at the TOP of each equestrian's newsfeed. This is the ideal advertising option for Equestrian Related Businesses, as well as Equine Professionals looking to expand their client base. Premier Equestrian Marketing will SPOTLIGHT your company through our extensive client reach on a BI-WEEKLY Basis. This Spotlight marketing is 2 times per week. Monthly Social Media Clients provide imagery to Premier Equestrian Marketing that we use to Spotlight your business. 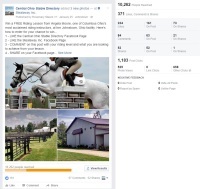 In addition to imagery, Clients may provide press releases, horse show results, and just about anything else they would like promoted through Social Media. Statistics Reports provided weekly to show number of hits/views your ad has received. Want to have a Social Media Presence, but have no time to set one up? Is technology not your thing? THIS is the best option for you! This is an ALL INCLUSIVE option for business professionals that do not have the time to maintain their own Social Media Networks. 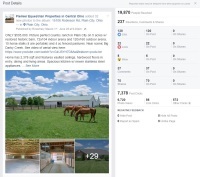 Premier Equestrian Marketing will MANAGE your Social Media Presence on Facebook, Instagram, and Twitter. In addition to setting up your Social Media Sites, we will provide UPDATES to all platforms on a Daily or Weekly schedule for 1 Monthly rate. This is a GREAT OPTION for maximum time management. Let us handle your Social Media Presence - so you can concentrate on your Business.